The government plays a small role funding mesothelioma research compared to funding other cancers. Federal organizations that provide funding include the National Cancer Institute, Department of Defense, FDA-sanctioned clinical trials and the National Mesothelioma Virtual Bank. There are a couple reasons why government funding for mesothelioma research lags far behind that of other cancers. The first is that the number of people affected by mesothelioma is small in comparison, with an estimated 3,000 new cases diagnosed each year. Another challenge for finding government funding for mesothelioma research is the public’s relative lack of awareness about the illness. When there is less awareness of a particular disease, there is less pressure on Congress to fund it accordingly. However, mesothelioma researchers and patient advocacy groups are working to secure more funding to help people diagnosed with mesothelioma. Doctors and scientists are securing additional grants to fund new breakthroughs in treatment methods. Patient advocacy groups are lobbying for more funding for research and clinical trials. 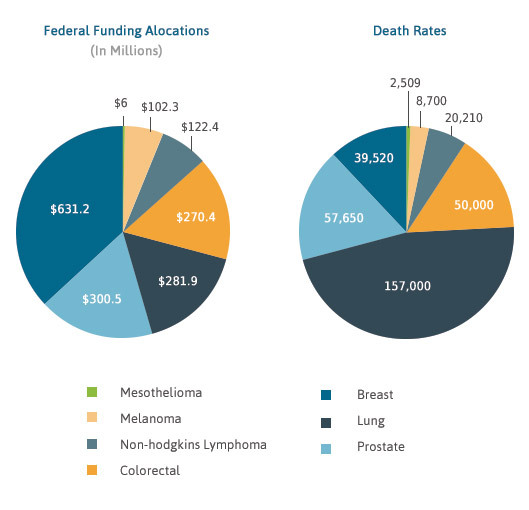 Thanks to these efforts, mesothelioma is receiving more federal funding than ever before. NCI’s total 2019 budget is $5.75 billion. This figure represents a $79 million increase from the institute’s 2018 budget. Funds are given to various research institutions based on the incidences and death rates of the most common types of cancer and other non-measurable factors. In 2017, breast cancer research received $545 million, which is more federal funding than any other cancer. That cancer takes in three times the funding of lung cancer research even though its death rate is one-fourth the amount. This is because of greater public awareness of breast cancer and more intensive lobbying. In comparison, federal funding for mesothelioma research was only $6 million or 0.1 percent of the institute’s annual budget from 2004-2007. However, funding for mesothelioma appears to be increasing. For example, the Abramson Cancer Center received a $10.7 million grant in 2019 to study CAR-T cell therapy as a treatment for mesothelioma. The National Cancer Institute is a federal agency that was created in 1937 to be the nation’s principal organization for researching cancer. It is one of 27 institutes and centers that form the National Institutes of Health, which is part of the federal Department of Health and Human Services. The institute receives its funding from Congress and its mandate, as stipulated in the National Cancer Act of 1971, is to investigate the causes, prevention, detection, diagnosis and treatment of cancer through research projects and clinical trials. In 2006, activists for mesothelioma research appealed to the Senate’s Defense Appropriations Subcommittee, which recommends funding for the Department of Defense. The activists convinced the subcommittee that the department should fund mesothelioma research. They persuaded the department by explaining that U.S. Navy personnel file a third of all mesothelioma lawsuits. Activists stressed the relevance of mesothelioma research to service members, their families, veterans and their dependents. In 2008, the Congressionally Directed Medical Research Programs of the DoD established the Peer Reviewed Cancer Research Program, which was the first of its kind to fund mesothelioma research. The first mesothelioma grant was awarded to Dr. Courtney Broaddus, for her work on macrophage-induced inflammation in mesothelioma. Broaddus received $1.36 million to conduct her research. Four more grants were awarded in 2009. Two of the grants went to top mesothelioma specialists: Thoracic surgeon Dr. Harvey Pass and thoracic oncologist Dr. Lee Krug. An additional $3 million was awarded in 2010. A dedicated funding stream of $5 million was requested for mesothelioma research through the Congressionally Directed Medical Research Programs for the 2012 fiscal year. Increased funding for mesothelioma research has continued since activists convinced the department to join the cause. 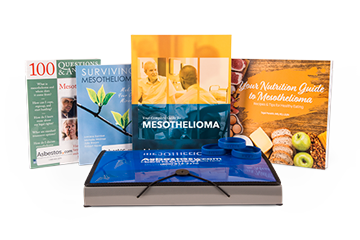 It is estimated that by the year 2020, there will be approximately 250,000 cases of mesothelioma diagnosed in the U.S.
Another way the federal government influences mesothelioma research is through the U.S. Food and Drug Administration’s sanction of clinical trials. Clinical trials are studies of new drugs and treatments to determine whether they will ultimately be approved by the administration. The administration does not fund or conduct clinical trials. Its role is to promote and enforce strict protocols to ensure that people who agree to be in studies are treated as safely as possible. A number of mesothelioma clinical trials are conducted every year to investigate new drugs and anti-cancer therapies. These trials bring researchers closer to affecting a cure for mesothelioma. The administration receives recommendations from mesothelioma experts on the best clinical trials to approve. For example, in March 2017, mesothelioma experts and research activists met in Bethesda, Maryland, for a mesothelioma clinical trials planning meeting. The objective of the meeting was to agree upon at least two or three multimodal trials to be conducted through the National Cancer Institute’s National Clinical Trials Network. Interested in Participating in a Mesothelioma Clinical Trial? The National Mesothelioma Virtual Bank is a virtual biospecimen registry that supports and facilitates basic scientific and clinical research. Their goal is to speed the discovery of preventive measures and find new treatments for mesothelioma. It is funded by the National Institute for Occupational Safety and Health, the federal agency responsible for conducting research and making recommendations for the prevention of work-related injury and illness. NIOSH is part of the Centers for Disease Control and Prevention within the U.S. Department of Health and Human Services. Penn Medicine. (2018, October 22). Abramson Cancer Center Receives $10.7 Million to Study CAR T Cells in Solid Tumors. National Cancer Institute. (2018, October 3). NCI Budget and Appropriations.